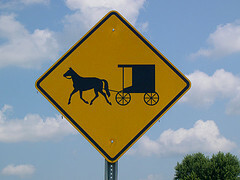 The last outbreak of poliomyelitis in the United States occurred in 1979, when a type 1 strain imported from the Netherlands caused 13 paralytic cases among unvaccinated Amish communities in three states. Twenty years later, use of the live, attenuated poliovirus vaccine (OPV) was discontinued in the United States, and was replaced with the inactivated vaccine, IPV. How do we explain the 2005 outbreak of polio in an Amish community in Minnesota? The infant in this case was five months old when it was hospitalized for fever, irritability, bloody diarrhea, and recurrent infections. Vaccine-derived poliovirus (VDPV) type 1 was isolated from a stool specimen, but paralysis did not occur. VDPVs are excreted by individuals who receive OPV; they have been shown to circulate for long periods and cause outbreaks of paralytic disease in undervaccinated populations. Similar VDPVs were subsequently isolated from four other children in the same Amish community, none of whom were ill. A total of 8 out of 23 children tested had virologic or serologic evidence of type 1 poliovirus infection. Sequence analysis of the VDPVs was used to estimate that the virus had probably circulated for 2 months in the community before infecting the infant. Such estimates are based on the known rate of sequence change in the poliovirus genome as it moves through the human population. The origin of the VDPV was not identified, despite extensive virological and serological studies of other communites in the US and Canada which might have had contact with the individuals in Minnesota. The source of the virus is probably a recipient of OPV outside of the US and Canada – these countries stopped using this vaccine in 2000 and 1995-96, respectively. The infant was subsequently diagnosed with severe combined immunodeficiency, a disease characterized by defects in B and T cell immunity and frequent infections. Poliovirus was detected in her stool until January 2006, after which the immunodeficiency was corrected by bone marrow transplant and the virus was eliminated. All previous outbreaks of poliomyelitis caused by VDVP were in undervaccinated communities in underdeveloped countries. The outbreak in Minnesota underscores the need to maintain high vaccination coverage: until OPV is replaced with IPV globally, circulating VDPVs pose a threat to unimmunized individuals. The outbreak is a harbinger of what could occur in countries where immunization with OPV is halted after the eradication of poliomyelitis. As the number of susceptible newborns increases, circulating VDVPs could spark an outbreak of poliomyelitis. Another reason for switching to IPV rather than stopping immunization altogether. All I can remember of taking this drug are the side effects. It became difficult to walk two miles in the morning, the distance I could swim comfortably slowly reduced and my legs started to swell. Between starting treatment and my next visit to the doctor was three months. He was very surprised. This drug has an excellent reputation for the treatment of type 2 Diabetes but take care. Thanks for the information on this, i never knew about the outbreak occurred in 1979. I understand there was an outbreak in the same year at a Christian Science College.